The Kane County Personal Injury and Commercial Litigation law firm of Kinnally Flaherty Krentz Loran Hodge & Masur P.C. is pleased to announce the selection of four of its partners to the list of Illinois' top attorneys, as evaluated by Super Lawyers, a national ratings service for the legal profession. Receiving this distinguished honor are attorneys Patrick Kinnally, Patrick Flaherty, Paul Krentz, and Mark Masur. Selection to this list signifies that the attorneys named have been rated by their peers as among the top 5% of all Illinois lawyers in their respective fields. Mr. Kinnally was previously named a Super Lawyer in 2006-2007 and in 2009-2016. His practice includes general and commercial litigation, zoning, probate litigation, local government law and immigration law. He recently prevailed at trial in a drainage dispute between neighbors and in a zoning/building permit dispute between a property owner and a homeowners’ association/village. He has received the highest rating from his peers for skill and integrity with an AV Preeminent designation by Martindale-Hubbell. He has earned a number of professional honors from the Illinois State Bar Association and from the Kane County Bar Association. These include the Community Service Award and the Pro Bono Service Award from the KCBA and the Tradition of Excellence Award and the John C. McAndrew’s Award for Pro Bono Service from the ISBA. He has also been named to a number of statewide boards and commissions by the Illinois Supreme Court, including the Illinois Supreme Court Commission on Professionalism, the Illinois Minimum Continuing Legal Education Board and the Illinois Supreme Court Committee on Civil Jury Instructions. Mr. Kinnally is past president of the KCBA and is a prolific author and lecturer on the state and local level. His practice focuses on general, commercial and probate litigation, administrative, environmental and local government law and immigration. Mr. Flaherty has been named a Super Lawyer every year since 2005. His practice is limited to all phases of personal injury, wrongful death and workers’ compensation cases. He has obtained many multi-million dollar verdicts and settlements, including the highest reported recoveries for birth trauma in Kane County, for wrongful death in Will County and for paraplegia in Kane County. Together with one of his partners, he recently obtained a life-changing confidential award for a construction worker who suffered brain damage after being struck by a train. His work includes medical malpractice as well as general negligence cases. He has received the highest rating from his peers for skill and integrity with an AV Preeminent designation by Martindale-Hubbell. He was presented with the Community Service Award in 2014 by the Kane County Bar Association and with the Lyle Oncken Community Service Award in 2013 by the Kane County 708 INC Board for outstanding advocacy on behalf of people with developmental disabilities. His is past president of the Kane County Bar Association and a past member of the Board of Managers for the Illinois Trial Lawyers Association. He is currently chairman of the Board of the Association for Individual Development, a non-profit organization in the Fox Valley serving people with developmental disabilities and mental illness. Mr. Krentz has been named a Super Lawyer every year from 2012-2016. His practice is concentrated in personal injury and wrongful death, and in general and commercial litigation. He has extensive experience in a wide variety of injury and death claims. He has been a leader in sexual abuse and nursing home litigation, in particular and he has obtained over 24 million dollars on behalf of victims of sexual abuse. He also has significant experience in eminent domain litigation, in which he has achieved the highest per acre verdict for a property owner in Kane County history. In addition to helping individual clients, Mr. Krentz has improved community safety through litigation that requires greater protections for quests on commercial property. He has been a frequent lecturer for continuing legal education programs and has been a longtime volunteer at Hessed House, a facility for homeless men, women and families. He has received the highest rating from his peers for skill and integrity with an AV Preeminent designation by Martindale-Hubbell. He was inducted as an inaugural member of the Plano High School Hall of Fame in 2010. Mr. Masur has been named a Super Lawyer in 2005-2007, 2012-2015, and 2017. His practice is limited to personal injury, wrongful death and workers’ compensation litigation. He has obtained multi-million dollar settlements on behalf of seriously injured people and on behalf of families who have lost loved ones. Together with one of his partners, he recently obtained a life changing confidential award for a construction worker who suffered brain damage after being struck by a train. He is also a leader in the field of work injuries, and he has helped many workers and families through the trauma of injury, disability and recovery. He has chaired the Workers’ Compensation Committee of the Kane County Bar Association. Mr. Masur has been a frequent lecturer in continuing legal education and he has been a longtime leader and volunteer with his church. He has received the highest rating from his peers for integrity with a Distinguished designation by Martindale-Hubbell. He was inducted into the Brentwood (Pennsylvania) High School Hall of Fame in 2012. He earned his law degree with distinction from John Marshall Law School in 1989 and was admitted to the practice of law in Illinois in 1989. “This news simply re-affirms the confidence we have in the skill and professionalism of every attorney practicing in this office,” stated Partner Jerry Hodge. “We could not be more proud of this recognition earned by Paul, Mark and our Pats”. According to its website, Super Lawyers is a rating service of outstanding lawyers from more than 70 practice areas. Those selected have attained a high degree of peer recognition and professional achievement. The selection process includes independent research, peer nominations and peer evaluations. No more than 5% of attorneys in each state are recognized by Super Lawyers. 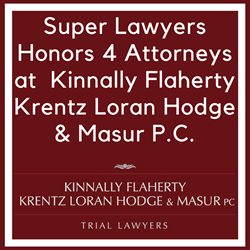 With offices located in Aurora, Illinois, the team of trial lawyers at Kinnally Flaherty Krentz Loran Hodge & Masur P.C. help clients throughout Northern and Central Illinois. They handle cases involving Personal Injury, Workers’ Compensation, General and Commercial Litigation, Business Counseling and Estate Planning, and Immigration and Citizenship. You can schedule a free consultation when you visit http://www.kfkllaw.com or you can call 630-907-0909.